This entry was posted on Tuesday, December 4th, 2018 at 11:00 am. Fairfield Farm College took part in the Wiltshire and Swindon Panathlon at Marlborough College on Wednesday 14th November. The college reports, “The event was organised by Wiltshire and Swindon Sport (WASP), which are a small team of 10 who are focused on helping people and communities across the county create a sporting habit for life. 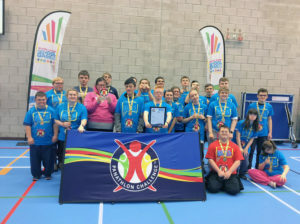 “Sports leaders Tom and Brodie and Wiltshire’s Young Athlete Role Model, Lizzie from Fairfield Farm College, used all their officiating skills to help organise and deliver Boccia, New Age Kurling and Polybat at the Swindon & Wiltshire Panathlon. They took on the challenge when asked, and did a fine job! “Students from different schools across the county played Boccia, NAK, Polybat and Table Cricket and competed in indoor athletics activities. Fairfield Farm College put in an amazing team effort and won Gold at the games.